The LINPAR is designed for the measurement of Photosynthetically Active Radiation (PAR) within plant canopies. 33 sensors are mounted within a 1 metre anodised "U" section tube. The sensors are covered with a 3mm diffuser providing an integrated reading over 850mm section of the sensor. At the cable end there are no sensors in the first 70mm and in the last 50mm at the distal end to provide for attachment. An integral "bulls eye" levelling sensor is provided. For complete canopy monitoring solutions the LSM-LINPAR can be used with the SFM-1 Sap Flow Meter, PSY-1 Psychrometer and the DRL26 Dendrometer. Measure PAR light along at least 1 meter length. 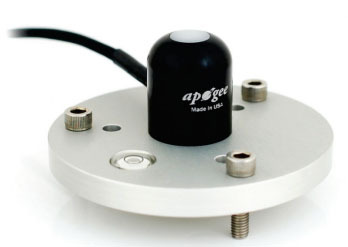 Suitable to measure PAR light above, within and below the canopy alone or simultaneously. The sensor can be directly connected to a Data Logger and the readout device Light Meter as device Light Meter as and when required. Quantum Sensor with suitable detachable cable and carrying case for field use. Light Sensor Meter - Configured for LINPAR linear PAR (ceptometer)Sensors. 5 sensor capacity; ruggedized water proof IP68 rated enclousure; 24-Bit integrated digital micro-processor, internal Lithium – Polymer battery; voltage regulator; standalone logging capability to MicroSD card. Supplied complete with 2GB MicroSD card and enclosure mounting bracket; Windows configuration and communications software for downloading and manual operation of the instrument; User Manual.